Even if the title is very similar to the one of my SoMobNet presentation (November 2011 in London) the content is quite different. Mobile Learning is a relatively young discipline, which already has – in some European countries more than in others – a stable standing in both, the scientific discussion and fields of practice. However, even if the mobile learning field seems to be a booming area that generates lots of ideas and future scenarios on how teaching and learning could or should be realised by using mobile and convergent technologies: the reality is often not as innovative and progressive as enthusiasts and advocates of the discipline want people make believe. This applies not only to theoretical approaches but also – and especially – to the practice realised in formalised learning contexts such as school. 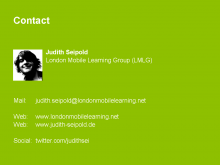 An analysis of the process of the mobile learning discussion in the U.K. and the German speaking countries Germany, Austria and Switzerland gives evidence to this fact. This analysis which considers the scientific process of the mobile learning discussion, mobile learning practice and methods for the implementation of mobile learning practice in formalised contexts allows to draw conclusions which have relevance not only for the current practice of mobile learning, but that also gives hints on which aspects should be focused by future research and on ways how mobile learning should be implemented in formalised contexts without ignoring the learners’ agency, cultural practices, expertise and knowledge. The first part focuses on the structure of the scientific process of the British and German speaking mobile learning discussion by considering central papers, projects and definitions. It will point out contexts, practices as well as phases and development lines that are relevant for and arising from the scientific discussion on mobile learning. The second part focuses on projects that are using mobile and convergent technologies in formalised learning context, i.e. school. The analysis of the use of mobile technologies in these projects, together with the results drawn from the structure of the scientific process, provide a basis for conclusions relevant for theoretical approaches to and the practical implementation of mobile learning, considering elements of a socio-cultural ecology of mobile learning (i.e. structures, agency and cultural practices of learners and learning; see Pachler et al. 2010). The third part of this paper brings together the results drawn from the preceding sections with the aim to highlight areas that need to be developed in future projects and research, that should be adjusted in favour of the learners’ agency, cultural practices, knowledge and expertises, and that can inform areas which are not reduced to learning with mobile technologies, but consider also general areas like didactic approaches to teaching and learning that are informed by a socio-cultural ecology. Pachler, Norbert; Bachmair, Ben; Cook, John (2010): Mobile learning: structures, agency, practices. With contribuitons from Gunther Kress, Judith Seipold, Elisabetta Adami und Klaus Rummler. New York: Springer.